As I mentioned on the other blog yesterday, we'll be spending some of our Vault time this Balmoral break taking in-depth looks at a few of the outfits included in Fashioning a Reign: 90 Years of Style from The Queen's Wardrobe, the exhibit currently on at Buckingham Palace (and, in separate versions, currently at the Palace of Holyroodhouse and soon to come at Windsor Castle). What better way to start than with a wedding thirty years ago, and a tiara freshly featured. Sarah Ferguson turned to Lindka Cierach for her wedding gown and Garrard for a tiara when she married Prince Andrew on July 23, 1986. 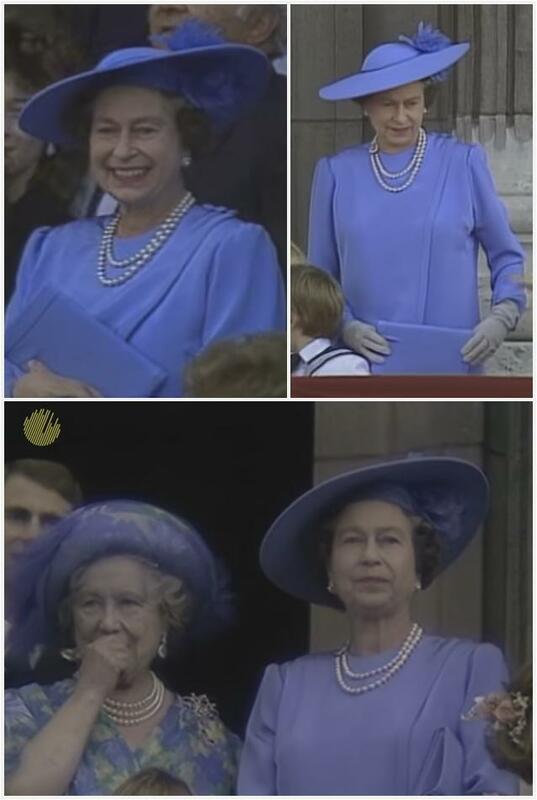 Meanwhile, her new mother-in-law turned to Ian Thomas for an ensemble in cornflower blue silk and a matching saucer hat with silk chiffon flower trim. The outfit featured a long top with a wrap detail and buttons fastening it on one shoulder, over a silk dress with a knife-pleated skirt. 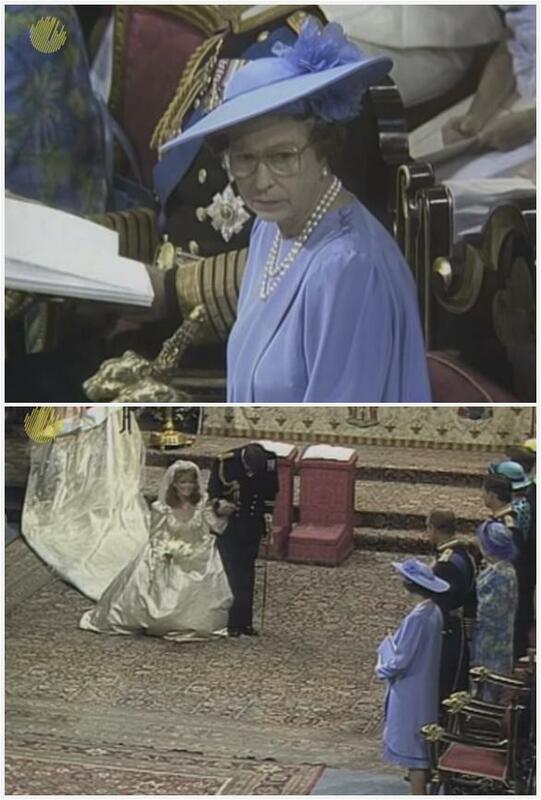 It was an ensemble with a lot of movement and flow - something that came in quite handy as The Queen famously chased after a young Prince William, who went running after the carriage as the newlyweds departed for their honeymoon. It was also, however, an ensemble that didn't lend itself well to a brooch, which is how The Queen came to attend a huge family event without her signature jeweled accessory. She compensated by wearing a serious double strand of pearls, the historical Hanoverian pearls (as is almost always the case with pearl necklaces, however, they're very difficult to pin down). She wore the diamond-set clasp to the side, adding a little sparkle in the absence of a brooch. The Queen wore the earrings from Queen Alexandra's Wedding Parure, another upgrade from her daily choices. The Queen Mother upgraded as well, using the Greville Peardrop Earrings during the day, as she liked to do for special events. The grandmother of the groom also wore a triple strand of pearls and a favorite sapphire and diamond brooch that she received from Queen Mary as a wedding gift. The Queen's outfit is dated by now, of course (though there are some similarities between the pleated bottom of this outfit and more current outfits, such as the peach number worn to the Opening Ceremony of the London 2012 Olympics). The hat, on the other hand, I could easily see fitting right in with the style of many of The Queen's younger family members today. When you transcend fashion, as she does, you never really go out of style.